Despite his extensive contributions to the Encyclopédie, d'Holbach is better known today for his philosophical writings, all of which were published anonymously or under pseudonyms and printed outside France, usually in Amsterdam by Marc-Michel Rey. His philosophy was expressly materialistic and atheistic and is today categorised into the philosophical movement called French materialism. In 1761 Christianisme dévoilé appeared, in which he attacked Christianity and religion in general as an impediment to the moral advancement of humanity. The deistic Voltaire, denying authorship of the work, made known his aversion to d'Holbach's philosophy, writing that "[the work] is entirely opposed to my principles. This book leads to an atheistic philosophy that I detest." Christianity Unveiled was followed by others, notably La Contagion sacrée , Théologie portative and Essai sur les préjugés. D'Holbach was helped in these endeavours by Jacques-André Naigeon, who would later become his literary executor. 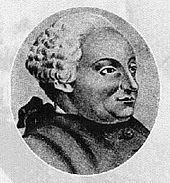 D'Holbach is believed to have died shortly before the French Revolution. He was buried on January 21, 1789, in the ossuarium beneath the altar in the parish church of Saint-Roch, Paris. This ossuarium has been ransacked twice, once during the French Revolution, and again during the 1871 Paris Commune. Later in 1754, when he learnt that Mme d'Holbach had died, Rousseau wrote a tender condolence letter to d'Holbach, and the friendship between the two men was rekindled. For three more years, Rousseau would frequent the salon of d'Holbach. D'Holbach later arranged, along with Grimm and Diderot, for an annuity of four hundred livres for Rousseau's common-law wife Thérèse Levasseur and her mother, pledging them not to reveal this to Rousseau for fear of wounding Rousseau's pride. When Rousseau eventually found out about this, he was furious with his friends for humiliating him. During the French Directory, a book of d'Holbach was circulated to all departmental heads in a bid to rein in religious revivalism. In England, d'Holbach's views influenced Priestly, Godwin, and Shelley. In Germany, d'Holbach's views influenced Immanuel Kant. It is speculated that d'Holbach's views influenced the historical materialism of Karl Marx. What's the good word on Baron d'Holbach?